San Diego Gas and Electric (SDG&E) is issuing its 2014 All Source Request for Offers (“RFO”) to solicit bids in accordance with Decision (D.) 14-03-004 – Decision Authorizing Long-Term Procurement for Local Capacity Requirements due to Permanent Retirement of the San Onofre Nuclear Generation Station (the “Track 4 Decision”). For more information, click on the link for each specific resource. Resource-specific RFO forms, documents, schedule and frequently asked questions can also be found by clicking the links above. The below diagram provides a high level overview of SDG&E’s procurement authorization for this RFO. 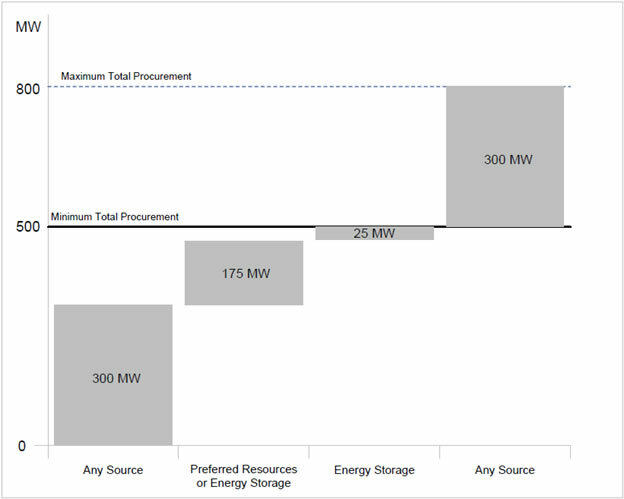 As shown in the above diagram (from D.14-03-004, p. 98), SDG&E is authorized to procure up to 800MW of energy storage, up to 775MW of preferred resources (not including energy storage) or up to 600 MW from ‘any source’, such as conventional resources or some combination thereof totaling up to 800 MW. SDG&E has separately filed an application for Commission approval of a 600 MW bilateral contract with a conventional resource, the Carlsbad Energy Center (A.14-07-009). If approved, 600 MW of SDG&E’s need will be filled by this contract and SDG&E will be authorized to procure a minimum of 200 MW of preferred resources, including at least 25 MW of energy storage. In this event, bidders will be notified that 600 MW of the need eligible under this RFO has been filled. SDG&E is soliciting third party-owned, contracted resources for all of the product types listed above with the exception of energy storage. For the energy storage product type, SDG&E is soliciting both third party owned, contracted resources and energy storage systems to be owned by SDG&E (more information on Utility owned storage can be found in the Energy Storage RFO document). SDG&E’s solicitation process is designed and intended to evaluate the different resource types (and ownership structures, in the case of energy storage) on an equivalent basis. SDG&E will consider loading order ranking of the resource types as a qualitative factor. Each Respondent is limited to six bids. Bids may include multiple locations, hybrid technologies, or phased development as long as the package is priced as a single bid. Variations in critical project details, like commercial operation date, contract term, energy deliveries, capacity, interconnection point, or operational constraints, must be submitted as separate bids. For example, a project consisting of multiple 5 MW storage systems sited across San Diego to be installed in phases over the course of 2 years for one all inclusive price would be considered one bid. However, a project consisting of one solar facility located at a specific substation with six different possible commercial operation dates would be considered 6 different bids. SDG&E encourages Diverse Business Enterprises (“DBEs”), “Women-Owned Businesses” or “Minority-Owned Businesses” or “Disabled Veteran Business Enterprises” as defined in G.O. 156, to participate in this All Source RFO. Furthermore, SDG&E encourages developers to utilize DBEs during various stages of project development and construction. As a part of G.O. 156, SDG&E will require developers to identify and verify their DBE contractor/subcontractor spending if any. SDG&E’s DBE Program representatives will provide a presentation during the bidders outreach event on September 26, 2014. DBEs can request additional information by contacting SDG&E at [email protected]. Q&A documents have been updated to include questions received at the Pre-Bid Conference on 9/26, please see each product type webpage for product type specific Q&A. Some edits have been made to previously posted Q&A, these changes will appear in redline. Please submit questions to SDG&E’s RFO team by email at [email protected]. SDG&E’s initial responses will be available one week after the first bidder’s conference. SDG&E will post responses periodically thereafter. The deadline to submit questions is November 14, 2014 and SDG&E will post its final responses on December 1, 2014. The following schedule and deadlines apply to this RFO. SDG&E reserves the right to revise this schedule at any time and at SDG&E's sole discretion. Respondents are responsible for accessing the resource-specific websites on a regular basis for updated schedule and possible amendments/changes to the RFO or the solicitation process for a specific resource. Offers must be uploaded to and received by the RFO Website no later than 1:00 PM Pacific Prevailing Time on January 5, 2015. * Negotiation time will vary depending on proposal specifics including proposed contract modifications. The first event is scheduled for September 26, 2014 which will be an in-person event (with dial-in / webinar available for those that cannot attend in-person). The second event will be a conference call / webinar only and is scheduled for October 24th. The third event will focus primarily on the demand response, energy efficiency and energy storage product types will be in-person (conference call / webinar available) and is scheduled for November 10th. Participation in these events is NOT mandatory in order to submit an offer. Please monitor the RFO website for further details (such as conference presentation materials, location details, and final arrangements). SDG&E will also make an effort to notify bidders of outreach event details via e-mail. All questions or other communications regarding this RFO must be submitted via e-mail to [email protected]. The deadline to submit questions is November 14, 2014. All questions and answers will be posted on this website (see RFO Questions and Answers Link, above). See http://www.thesupplierclearinghouse.com/eligibility/default.asp for the definition of a DBE.